Washington’s intention to re-impose the "toughest" sanctions on Iran appears to be playing into the hands of Chinese investors and oil futures traders, analysts have come to believe. Shanghai crude oil futures ISCc1 have recently seen a significant uptick in their trade volumes, which hit a record 250,000 lots last Wednesday, a day after Trump announced the US was withdrawing from the 2015 Iran nuclear deal. 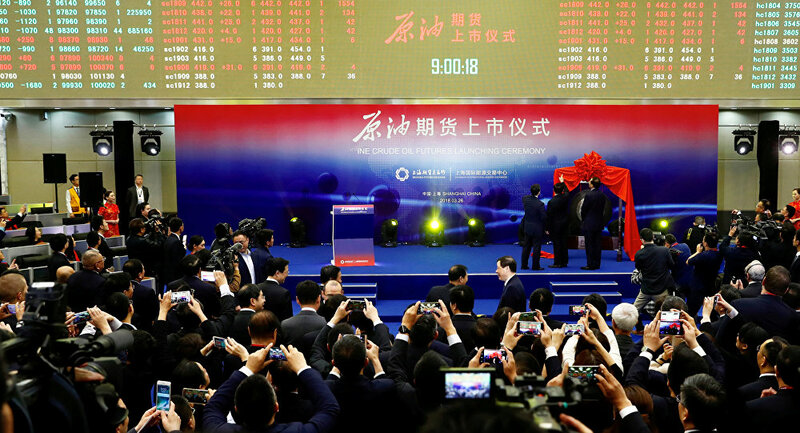 The day before, they were noticeably half of that marker, the Chinese oil futures accounted for eight percent of the global market, which after the pullout announcement climbed to 12. Stephen Innes, head of trading for Asia/Pacific at futures brokerage OANDA in Singapore, told Reuters that the petro-yuan contract is "thundering into action," standing a big chance of eventually rivalling internationally-recognized crude oil benchmarks such as Brent LCOc1 and WTI CLc1. Known for its extensive oil demand, China is the top consumer of Iranian oil, a role which the world’s second largest economy has confirmed following the US sanctions plan. The spike in trading volume is in part the outcome of Trump’s decision, Barry White, senior vice president for derivatives in Singapore at financial services firm INTL FCStone, was quoted by Reuters as saying. "The sanctions… can potentially accelerate this process of establishing a 3rd (oil) benchmark," White said. Earlier, top Iranian official Pirooz Mousavi, who heads the National Iranian Oil Terminals Company (NIOTC) in control of oil export points, noted that the potential US sanctions have not so far affected the flow of Iranian oil to global markets or to China. He went on to say that exports continue to hold at an average of 6 million barrels per day. On May 8, Donald Trump announced that the US would pullout from the 2015 nuclear deal between Iran and the UNSC’s P5 countries plus Germany. In a move closely linked to the announcement, Washington is intending to re-impose the Iranian sanctions lifted in 2015 after the Joint Comprehensive Plan of Action (JCPOA), was struck in 2015 following Iran’s vow to scrap its nuclear program. The most severe limitation reportedly has to do with Iran embarking on financial deals involving the US dollar, as well as Iran’s oil sales and other energy-related investments. Is China Preparing a Yuan Surprise in the Trade War With the US?